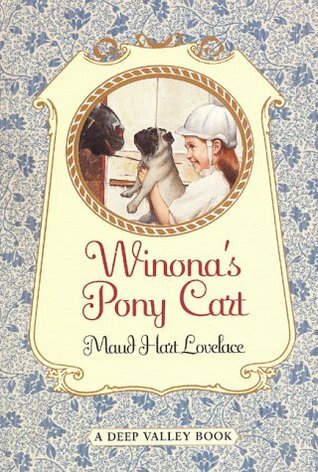 Winona's Pony Cart is the third of the three Betsy-Tacy spin-offs, but the second one I have read, due to it and Carney's House Party being published together in the same volume. The novel was published prior to Betsy's Wedding, but is set much earlier, when Winona is about to turn eight years old. What Winona wants more than anything is a pony, and despite the fact that her father has said she can't have one, she has developed a strong belief that she will receive a pony for her birthday. So certain is she in fact that she brags to Betsy, Tacy, and Tib about it, and then invites several additional children to her party without telling her mother. When the day of the party arrives, there is a pony at the party, but this does not mean Winona's dream has been totally fulfilled. Every child can relate to the desire for that one special birthday present, and Lovelace captures it well in this quick read. Though Winona is clearly very spoiled, she is not especially bratty. She, like many kids, just gets caught up in the excitement of possibly having the one thing she wants more than anything else. Any child who has ever had to limit the guest list at a party also understands her desire to invite extra guests, and her complete disregard for the fact that her mother would need to be told of the additions. Winona is just a very real character, and everyone has either been in her shoes, or knows someone very much like her. This book really drives home Lovelace's talent for turning everyday experiences into engaging stories. The writing in this book is so effortless, and girls who are the same age as Winona will love it, even today, because it touches on a universal experience and turns into a very satisfying story with a well-earned happy ending.